Wonder Woman finally takes a moment to catch her breath and attend a friend's wedding�but horrors follow her even there! Someone close to Diana is behind this attack on her friends�but what has this person learned about her powers that she never even knew herself? And when Wonder Woman saves Steve Trevor from dying on the shores of Themyscira, his life-and hers-changed forever! 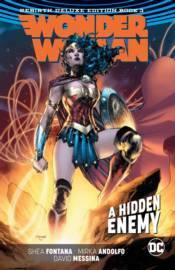 Collects WONDER WOMAN #26-30, Wonder Woman: Steve Trevor #1, Annual #1 and the Wonder Woman 75th Anniversary SPECIAL #1.